David Miller - Lancashire Wildlife Artist. He paints mostly British wildlife, usually in oils, preferring to return again and again to subjects he knows well. Born in Oldham, Lancashire in 1966, David Miller now lives and works in the heart of the West Wales countryside, in a wooded valley near the Taf and Towy estuaries with the dramatic Pembrokeshire coastline on his doorstep. He paints mostly British wildlife, usually in oils, preferring to return again and again to subjects he knows well, travelling widely to gather reference and inspiration for his work. 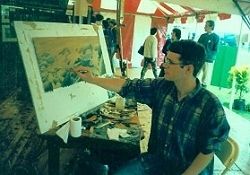 David is perhaps best known for his underwater studies of game and coarse fish, inspired by a lifetime passion for angling and by many hours spent snorkeling and diving in rivers, lakes and gravel pits. This knowledge and understanding of his subject is clearly reflected in his work and has led to him becoming perhaps the best known and well-regarded fish artist in the country. Internationally, his larger fish paintings now hang in London, Tokyo and New York boardrooms. 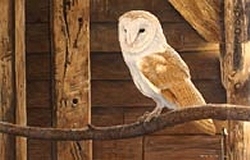 Thanks to David Miller, the Lancashire wildlife artist who has donted several of his magnificent owl and bird of prey, personlised signed prints.